Being a Notary Public is an Asset! *State resident or have an office or place of business in New York. *Must read, write and understand English. *Be of good moral character. *Must have the equivalent of “common school education”. *No conviction of a felony or certain misdemeanors unless an executive pardon or a parole board certificate of good conduct has been received. The Chamber Coalition (NACC, AAICC and HAICC) has partnered with the Law Firm of Figeroux & Associates to offer a 3-hour Notary Public Training Program. 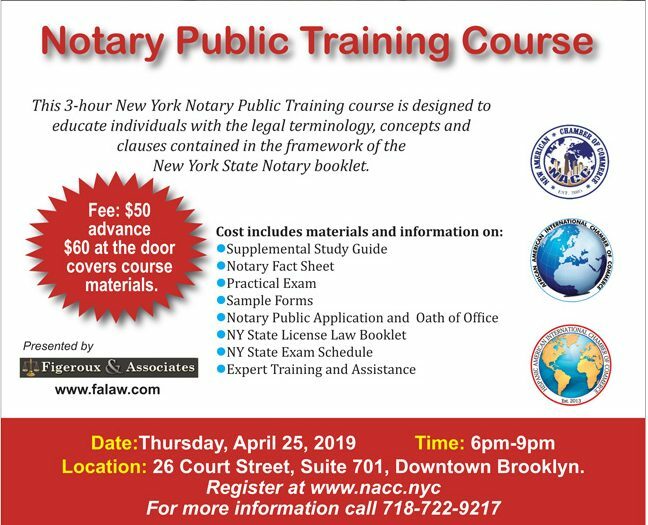 This seminar, which is open to students, alumni, and the general public, covers everything you need to become and serve as a Notary Public for the State of New York. The Training Program is presented by Brian Figeroux, Esq., Senior Partner of the Law Firm of Figeroux & Associates. To register for the Chambers’ notary training program visit www.nacc.nyc or call 718-722-9217.